UNICEF and LEGO have teamed up to help children around the world learn problem-solving, creativity, communication and teamwork. In a classroom in Jordan, Syrian refugee children are hard at work constructing sprawling, multicolored towers and fantastic machines. There's plenty of excited conversation as they share ideas, pass building materials back and forth and proudly display their finished creations. Play is the work children do. That's why UNICEF and the LEGO Foundation have teamed up to help children everywhere reach their full potential. Over the past three years, the partnership has promoted quality early learning through play for children in 48 countries around the world, increasing the global capacity to leverage early-learning opportunities and driving global understanding and commitment to the value of play in education. 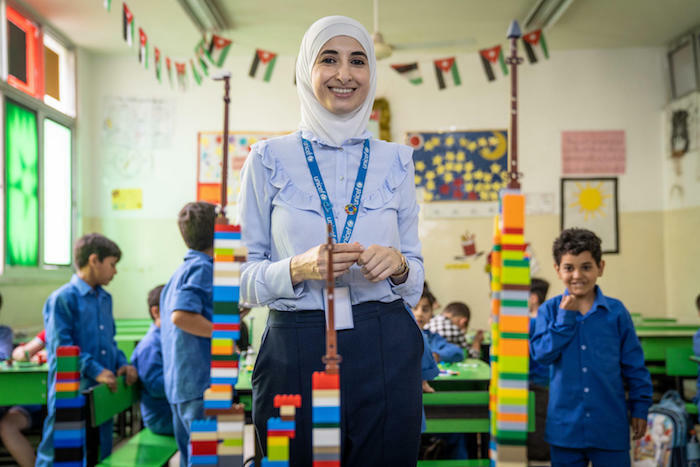 In Jordan, the LEGO Foundation donated 3,000 LEGO Duplo Play Boxes and 1,100 LEGO Play Boxes to schools, kindergartens and Makani Centers so that more than 145,000 children in vulnerable communities can have fun while learning skills like problem-solving, creativity, empathy, communication and teamwork. The donation also included training in play-based methodology for 210 facilitators and 800 Ministry of Education employees, half of them kindergarten teachers. 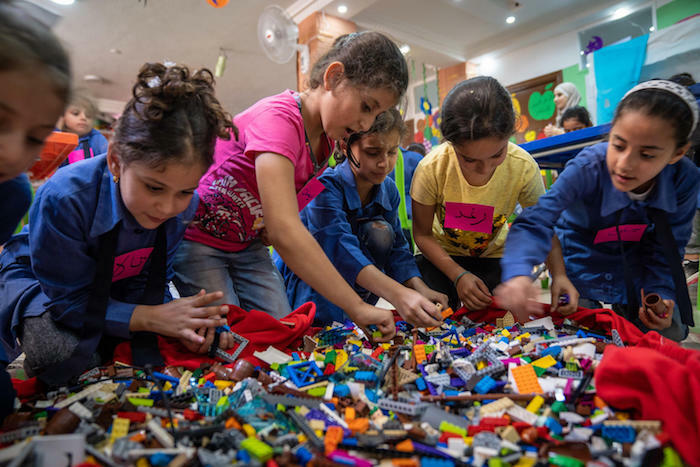 "UNICEF is delighted to partner with the LEGO Foundation to promote quality learning and provide psychosocial support for vulnerable children in classrooms and in their communities across Jordan," says Robert Jenkins, Representative, UNICEF Jordan. "Finally my dream came true when I saw the LEGO bricks in front of me," says Yousef, 9. "We can make a house, an airplane, a machine and many other things using them." "Learning through play is very important because it's child-centered," says UNICEF Jordan Early Childhood Development Specialist Sajeda Atari (above). "It makes the teacher take a step back and let the child be in the driver's seat and take control of the learning experience." Global evidence shows that play is one of the most important ways in which young children gain essential knowledge and skills. Learning through open-ended, collaborative play helps children cope with toxic stress caused by conflict and traumatic experiences. "They made us close our eyes and then we got a very sweet surprise," says Mira, 7. "It was a big box of LEGO bricks and we were really happy playing with them. When we built the tower, we couldn't make it steady at first. My friends and I, we share and play with each other and we don't fight." Fourth grader Sadeen (above) lives in Za'atari Refugee Camp in Jordan. She loves going to school and playing with LEGOs. "All of my brothers and sister want to become doctors but I will be an engineer, the first engineer in my family," says Sadeen. "I built a house out of LEGO and then I tore it down. My dream is to build a house and live in it." Since 2015, LEGO and UNICEF have collaborated to improve children's lives and futures around the world. 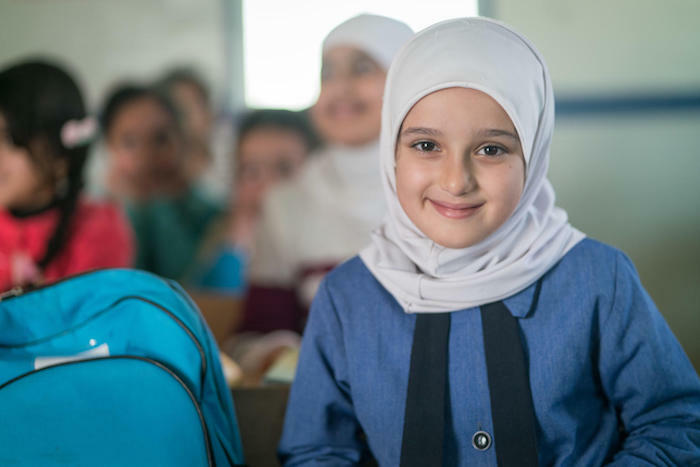 Leveraging private-sector core business operations, skills and know-how, UNICEF's partnerships with companies and foundations can be a game-changer for making a bigger impact on the well-being of children everywhere. Learn more about how play-based learning helps children grow up healthy and happy.